Many day hikers use an established campground as base camp for serial day hikes. Sleeping in a tent, on hard ground (they don't call it terra firma for nothing), is just part of the joy of base camping. To ensure a good night's sleep, you'll need to pick the best air mattress you can find. James Menta, of 3Beds.com fame, is here to help you out. The following advice, opinions and images are his way of getting you up to speed quickly on maximizing your chances of sleeping well while camping. Those noisy neighbors with the dog that barks constantly? Sorry, you're on your own. Just for the record, James and Hiking For Her have no affiliate relationship. If the tale of Goldilocks choosing a bed that's "just right" was re-written today, throwing an air mattress into the mix, the story would probably take a different turn. Instead of walking around from bed to bed looking for the one that's "just right", she would just dabble with firmness settings of the mattress. I can't help but imagine Mama and Papa Bear complaining that someone messed with their pump settings. Now, if Goldilocks lived today and had a few extra coins, she could get a high-end luxury air mattress. These not only allow you to choose how firm the bed is, but also choose different levels of firmness for the two halves, warm up one half while cooling down the other, and more. The tale would probably end with the girl helping Papa Bear with his bad back and Mama Bear with her hip pain. So, 30 seconds into the guide and I've already ruined one of our favorite childhood tales. Don't hate me for it, I'm just trying to grab your attention and make a point while I'm at it. I'll sharpen my proverbial pen and you "Roll up your mind's sleeves" and let's learn how to tell marketing hype from true value, and choose the best air mattress. It was the summer of 1889 and some smart folk in Reading, Massachusetts had a bit more on their mind than chilling on their porches over cold lemonade. They invented the air mattress as we know it today and started a company so creatively called the "Pneumatic Mattress & Cushion Company." 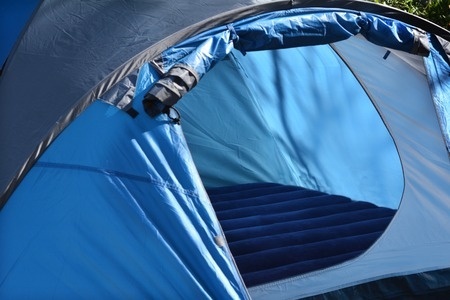 Fast forward a century and you'll find the air mattress moving from a flotation device that you see around pools evolving and finding its place in our tents, trailers and even our homes. The changes would probably come as a surprise even to the good people of the Pneumatic Mattress Company. The air bed design hasn't changed much until about a decade ago. With all the innovations in the last 15 years or so, a blow up mattress is becoming less of an alternative solution for unexpected guests, and more of a mainstream product. 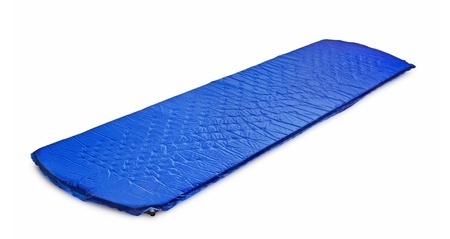 For a hiker, a low and light version of the product better known as the sleeping pad is the most interesting option. Backpacking air mattress might be another way to put it. But if you are driving to the trail, camping in a tent or crashing in a cabin, a full-blown air mattress (the kind you would use at home as a guest bed) is also a point of interest. That's the kind of air mattresses we'll be talking about here. So let's cut through the noise and get to the "meat" of the guide. Let us learn some things a lot of the companies making the beds don't want you to know. It's the obvious place to start looking for the best air mattress. Who better to tell you about a product than the people using it right now? This part is a bit tricky and most people go about it the wrong way. You have your eye on a specific model, you visit a website that carries it, read about it, and it all seems good. But the simple approach might lead to a wrong choice. The market is changing, and some of the companies try to save money the wrong way - by compromising the quality of the product. The bed might still have a rating of 4.5 stars that's earned over the past decade but the company might have moved production to a shady location, or changed the materials. Sort the reviews by the most recent and read the ones from people who just got the product. These are the most relevant when searching for the best air mattress. The reviews are not from actual verified buyers. The customer review system that some of the websites have in place can be gamed. For example - you can leave a review even if you didn't buy the product. This leaves room for manipulation and ratings that don't reflect the quality of the product. Disregard the reviews from websites that don't have a system in place to verify real buyers. You could be tricked by the company leaving reviews about its own product, or the competition beating it down to promote their own. Most of the trusted online retailers have a good protection in place - make these the source of your information. The sample is not big enough. Imagine this scenario: The air mattress company launches a new product, buys 10 of it and leaves eight 5-star and two 4-star reviews. The product is suddenly the top-rated, and you are tricked into believing it's the best out there. Don't go for anything with less than 20 reviews. Even if they are all legit, the product is still to pass the test of time. An air mattress is a very specific product and the reviews you read should be interpreted differently. The main issue here is air retention. It's scientifically proven that a negative review is much more powerful than a positive one. So, you read a review that says an air mattress holds air like a champ, and then one saying that it deflated completely the first night. An air mattress is delicate and can be damaged in transport. This means it can be flawed on arrival and you'll always see experiences of people saying it doesn't hold air. So how do you know the negative experiences are reflections of a statistical error, or a true quality issue? Make this your rule of thumb: Sort the reviews by the most recent, add the percentages of 4 and 5-star reviews, and do the same with the 1 and 2-star reviews. If the ratio of the positive vs. negative reviews is lower than 4, move on. There is a strong chance there's something wrong with the air mattress. The main difference in design between old-school air mattresses and the ones that are finding their way into our bedrooms and tents today are air chambers (cells). It used to be 5-10 chambers that run top to bottom, and today, a good air bed is split into 40+ smaller chambers designed to "imitate" a spring in a regular mattress. The top of most modern air mattresses is flocked (velvet-like material) for extra comfort. And a flocked top prevents the sheets slipping under you. To mimic a steel spring, distribute weight and prevent the sleeper sinking into the middle of the mattress. This has been one of the main comfort issues before the chambered design kicked in. To increase durability. With the old design, if there was any sort of a defect in one of the chambers it would cause increased stress on the connections and before you knew it, you'd be sleeping on a deformed bulge. With modern air mattresses, even if one of the chambers gives in, the problem is isolated to the one chamber. 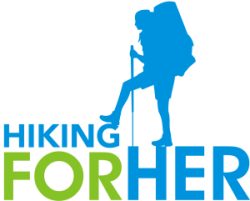 What does it mean for a hiker? When choosing the best air mattress for your money look at the specs to see how the chambers are designed. Look for words like "comfortcoil", "durabeam", "air coil". NOTE: Low-rise air mattresses rarely feature air coil design. Hand pumps and leg pumps are becoming obsolete. Powerful electric pumps are all the rage these days. Although pumping an air mattress for half an hour is good exercise, as a hiker you already spent the day straining your body, and the last thing you want is extra work. 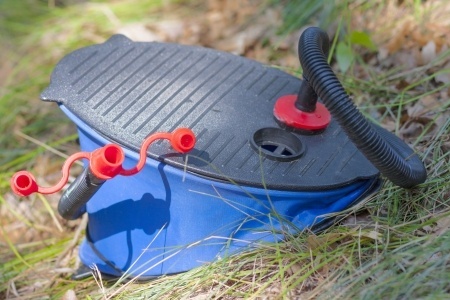 If you are camping and don't have access to power, just make sure that the pump lists "battery operated" as one of the options. If you are car-camping or your tent can accommodate a full air mattress, choose one that has a battery powered pump instead of a hand pump. The choice of manual vs. electric is not really a choice any more. The focus has shifted to what is called a "never-flat" pump. It's as convenient as it sounds - a blow up mattress with a "never-flat" pump is basically a mattress with two pumps. the other one adds air when it "recognizes" a drop in pressure. The new pump technology eliminates one of the main comfort issues - air loss. Not too much really, unless you are sleeping in a cabin or some place where you have access to power. That's because, in order to work, the never-flat pump needs to be plugged in at all times. Not really an option for most hikers. If we had to pick one advantage an air mattress holds over all the other options, it would be the adjustable level of firmness (remember the annoying babble about Goldilocks from the beginning). That's why a lot of people choose air mattresses as their permanent beds. They can keep your spine aligned (especially helpful for side sleepers) and help with health issues like back pain. If you have back pain problems, an air mattress might be your solution. The right firmness eliminates pressure points and soothes aching muscles along your spine. Puncture resistant. You've heard that one before, right? It would be great if only it were true. It still eludes me how some of the companies are getting away with advertising air mattresses as puncture-resistant. It's a vague statement and it doesn't really mean anything. If your shoe is water-resistant it will keep your feet dry as you're walking through puddles and snow. So, an air mattress should never get punctured unless you stab it, right? Well, tell that to every air bed that has ever met a prickle of a holly along the trails of eastern U.S. So, instead of falling for the vague marketing fillers, look for specifics like the thickness of the vinyl, or reinforced layers of textile/rubber. No air mattress you would take hiking is "puncture-resistant". Some of them are simply more or less prone to punctures. If your plan is to use it outdoors, it's a good idea to have one or two foam mats to lay underneath it. If you are using an air mattress it probably means you are car camping, and how hard is it to throw two foam mats into the trunk? Obviously, get a cheap patch kit that's intended for the kind of PVC an air mattress is made of ... and no, crazy glue and a piece of cloth are not going to cut it. The air bed patch kits are cheap, they do work, and can save the day. This one is pretty simple so let's go over the obvious. Twin XL (XL stands for extra long: 38x80"); not too many companies make these, and the options are limited to a few good models. King and California King (76x80" and 72x84"); not too many hikers would be interested in these, they are more of an option for your home. Again, the obvious: think about your hiking plan, the size of your tent, and which one of these is a good fit. For a hiker...twin or full size will be the sweet spot. For each of these sizes, you can go with a low, mid or high rise air mattress. Air beds are still struggling with the reputation of being somewhat of a health hazard. Intuitively, we assume it's about the PVC and the chemical fumes. This USED to be true back in the day. Today, the health regulations are strict, and the companies have been making a conscious effort to completely shift to eco-friendly materials. What was so bad about the PVC used before? It was chemicals called "phthalates". That's why pretty much all top brands of air beds (like Aerobed, Coleman, SoundAsleep) stopped using the toxic chemicals and switched to "phthalates-free PVC". The perceived health risk is misplaced, and the research in the following graph illustrates it very clearly. I hope that we've taken a few big steps from the confusion surrounding the choice of the best air mattress to a place of understanding. There is a lot of misleading info out there and vague statements in the advertising of air beds, but it's just the way it is. It's the job of the companies to sell their products and it's ours to make sure we get our money's worth. Instead of frowning about it, the best thing we can do is to educate ourselves and make smart choices. Again, forgive me if I ruined the Goldilocks tale in this process. Comfortable sleep is within your reach on a camping trip. And car camping is just another way to say base camp for day hiking, right?